What: Fantasy-themed plastic figures reminiscent of the fantasy figures made by DFC. 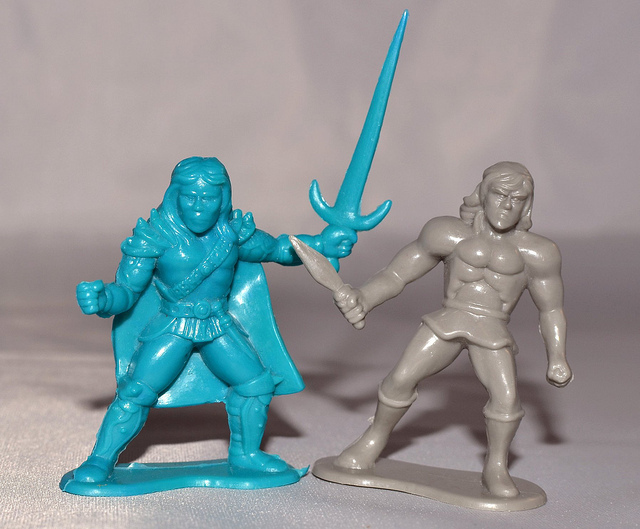 These were sold together in a playset that also included weapons and castle pieces. 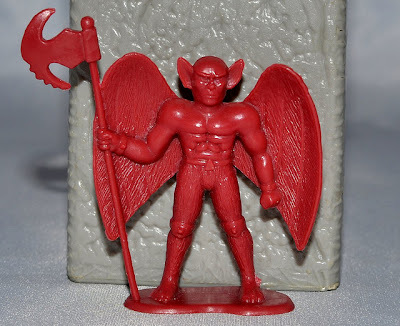 There are a couple warriors/barbarians in addition to a few creatures, including a pretty cool scorpion man, a winged demon and a guy with an animal head that looks kinda goofy. 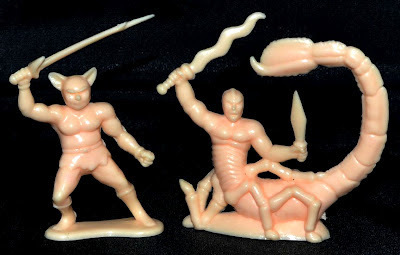 I recently learned that there were a number of figures produced in this set, which can be seen in the bottom photo above courtesy of LittleRubberGuys.com member irbaboon, and that they were sold in a variety of ways under a variety of names. They are also related to these plastic skeleton warriors. When: I picked these up in the late 1990s/early 2000s. I'm not sure if that's when they were first produced or if they existed in a different capacity before then. Where: U.S. (at least). I got the playset at a dollar/bargain-type store called Amazing Savings. I'm not sure in what other stores they were sold. Who: Released in various ways by various companies, including Polotoy and Schylling. No, no, no not DFC. I should know I collect them! (I'm the guy that posted the first comment about the DFC Figures) They look so much like Toyco to me, a DFC BOOTLEG. Thanks for the link! Wow, it's clear they based these figures off those game pieces. I painted these and used them in my 54mm fantasy medieval wargames. I had units of devils, flying and non flying. My Teutonic knights dealt with them! I love these figures and they are from a company called Polotoy/Schylling and were made in the 1990s. 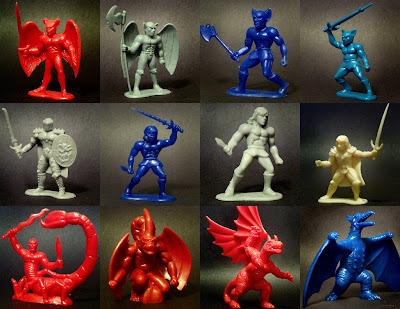 I do have some of these figures but i would love to own some more Warriors,Demons and Goblins. Would you be willing to sell me any? The two guys with big cat-like ears look something like the Toyco knockoffs of DFC ogres, but a little less crude. So, knock-offs of knock-offs! Love the scorpion man. Are these in the 40-54 mm range?